Many of the web sites you visit may collect your personal information and use it in ways that might surprise you. Privacy Bird® and Privacy Finder are tools that help you find out what web sites will do with your information before you provide it. Privacy Bird is a free tool you can add to your Internet Explorer web browser. Privacy Finder is a free online search engine that will help you identify web sites that respect your privacy. Privacy Bird lets you see what's really going on at Web sites. The bird icon alerts you about Web site privacy policies with a visual symbol and optional sounds. Privacy Bird reads privacy policies written in the standard format specified by the World Wide Web Consortium's Platform for Privacy Preferences (P3P). We invite you to download Privacy Bird software for free. This software will help Internet users stay informed about how information they provide to Web sites could be used. 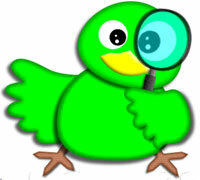 Privacy Bird automatically searches for privacy policies at every website you visit. You can tell the software about your privacy concerns, and it will tell you whether each site's policies match your personal privacy preferences. The software displays a green bird icon at Web sites that match, and a red bird icon at sites that do not. As you spend more time on the Internet, more information about you and your Web activities is being shared with Web sites and may be used without your knowledge. It is difficult to determine which companies are getting access to your information or what they will do with it. Privacy Bird puts you in control, giving you quick access to information about Web site privacy policies and timely warnings about Web sites that may use your personal data for purposes that are not acceptable to you. To learn more about this software, please take a tour or download a beta version of the software now. PRIVACY BIRD¨ software was originally developed by AT&T Corp. As of version 1.3 Beta, it is now maintained by the CMU Usable Privacy and Security Laboratory at Carnegie Mellon University. This is a beta release, not fully supported software. The help files and FAQs should answer many of your questions, including how to uninstall this software. We are sorry that we are currently not able to offer a version of this software for Macintosh or Linux operating systems, or for Netscape or Opera web browsers. We are now making our source code available so that others may port it to other platforms in the future. Please send questions, comments, and bug reports to support at privacybird.com.